The annual Holker Garden Festival in Cumbria took place on 3rd – 5th June 2011 and as usual wowed visitors with award winning garden designs, grower’s displays and floral arrangements. All the regular features of the show, such as the horticultural marquee, show gardens and trade stands were joined this year by a new Garden Theatre, where experts shared their experiences, including special guest Carol Klein who visited on Saturday and presented her “Life in a Cottage Garden” talk, along with questions and answers alongside Holker Hall’s Head Gardener Yvonne Cannon. Carol Klein’s huge popularity with festival visitors saw her return to Holker for a second consecutive year. Carol is a familiar, inspiring face as presenter of BBC Gardener’s World, as well as her own series “Life in a Cottage Garden” and “Open Gardens”. Apart from running her own nursery in Devon, she is also author of a number of highly informative gardening books and regularly writes articles and columns for gardening magazines. The garden theatre sponsored by Beetham Nurseries, seems to have been a great success, with many visitors saying it was a welcome addition to this valuable horticultural event. Children from the local schools also had their moment of glory, when Carol Klein along with Marc Charnley from Crooklands Garden Centre, judged and presented the prizes for the Schools garden design competition. Three primary schools entered the South Lakes Coast garden competition; Dane Ghyll County, Yarlside and Thwaites. Dabe Ghyll County Primary school took first prize, with Carol declaring the other two joint runners up, because of their exceptionally high standard. The competition was sponsored by the North West Evening Mail, Holker Hall & Gardens and Crooklands Garden Centre. A photo opportunity allowed each of the groups to have their pictures taken with Carol. Her passion and enthusiasm for gardening is always obvious and let’s hope that some of this rubs off on our young gardeners. 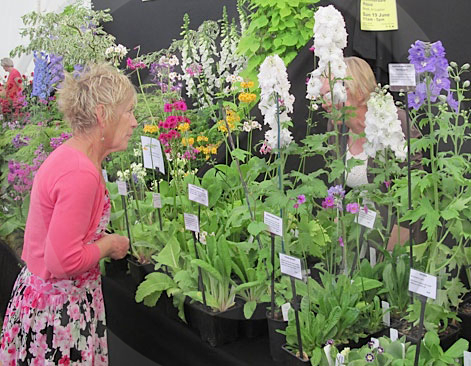 One of the most popular attractions at any gardening event are the show gardens. Showcasing the imagination and skill of local designers and landscapers. A record number of local designers exhibited their show gardens this year, with an exceptionally high standard of design and planting, showing how designers and growers understand their local environment. The contemporary white pavilion set in a stylish 21st century garden, featured a calm black pond into which the surrounding white hard landscaping reflected. A secluded relaxation area was enhanced by soft but sumptuous planting in shades of silver, purple, green and white, adding to the calming effect. Again this year, the standard of the nursery displays was striking and reflected in the number of Gold and Large Gold awards. Abi and Tom’s Garden Plants of Halecat, South Cumbria, swept the floor with awards. Their striking central display of naturalistic planting was awarded Large Gold, Best in Show and The Lady Cavendish award. Tom said; “This is our first horticultural show and we are absolutely thrilled to have achieved so many awards”. Talking to the pair, it is evident that gardening is a passion and they have recently taken over the nursery and plant centre at Halecat in South Cumbria. Other events at Holker this year include: The Literary Launch, Thurs. 16th June; Performances in the park between June and August and The Holker Horse Driving Trial on the 6th and 7th August. 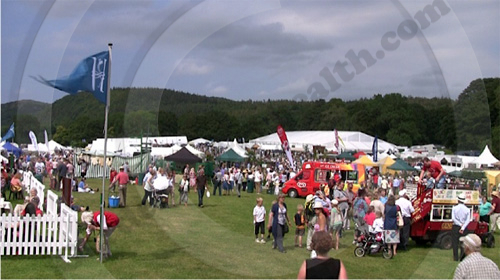 The 20th Holker Garden Festival in 2012 will be staged at the slightly later date from the 8th to 10th June, to accommodate the Queen’s Diamond Jubilee celebrations over the first weekend in June. Holker Garden Festival 2011 – Show garden awards – Find out more about the stunning designs and their creators. Holker Hall & Gardens – Keep up to date with events at Holker Hall in South Cumbria.